According to a friend of the deceased identified as Dewunmi Lagos, who took to Facebook to narrate the story, the deceased was being tortured by the Federal SARS officers at their office and he tied upside down. 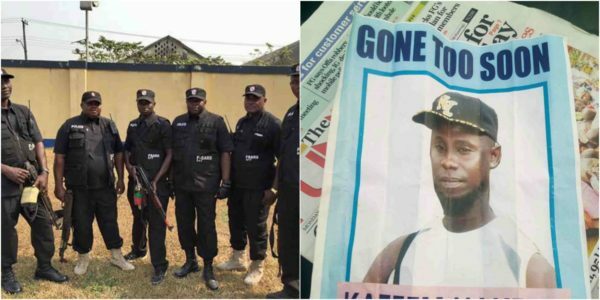 Kazeem was alleged to have died after the SARS officers untied him and he hit his head on the floor. I know kazeem very well, he’s one of the most gentle soul I’ve known. He looks rough but he’s so gentle, when we were talking sometime back in 2014 about election he asked me for MTN recharge card and I said he is richer than I am then he dragged my pocket and took the money from me and from there we got talking. I’ve met with him at Lagos garage in ijebu ode so many times and he is always hailing me. He was robed and arrested by FSARS squad, he was tied upside down and was tortured badly to confess what he knew nothing about, when they untied him, on getting down his head was smashed on the floor and he died. A letter has been forwarded to the secretary to the governor’s office (Ibikunle Amosun) and when he got the letter he said today in Ogun state Exco meeting will be for a short while because he wants to be present at the chief judge presiding over the matter today. The chief judge requested the corpse be brought to the court today and all the officers who arrested him and those who tortured him. We hope this will be a lesson to other security officers who think they can go Scotfree. Everyday for the thief and one day for the owner.